In case you’re wondering if that leaves room for home stagers, it absolutely does. Imagine the offers when you have 3, 5, or even 10, individual buyers bidding on a property. That’s what happens when it’s staged well. More and more people will fight over “the house that feels like home,” and that drives the final price ever higher. Stagers, no matter what type of real estate market you’re in, the homes that show the best will always get the most attention from real estate agents (because they’re easy to show) and home sellers (because they’re easier to fall in love with). I’m a little sad about Mother’s Day this year, because I won’t get to spend it with my Lil Millennial, or with my own Mom. We’re all in different cities right now. But that doesn’t mean I’m not in the mood to help you celebrate! 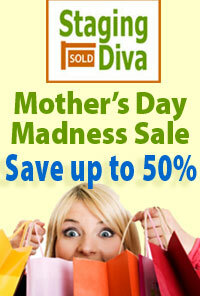 Tonight is the last chance to take advantage of the Mother’s Day Madness sale, with up to 50% off. This is the ideal time for stagers to stock up on coaching or any of my guides and courses to help you make the most of your creative talents. What sets Staging Diva apart from any other training company is that I’m totally focused on what you need to know to earn a living at this. There’s no fluff, it’s all important and actionable stuff. Delivered in the blunt talking, easy-to-understand style I’m famous for. Be the first to grab a free pass to a mini course I’m offering live by telephone conference call on May 16. – Should You Take Your Own Staging Photos? Keep your comments and questions coming. 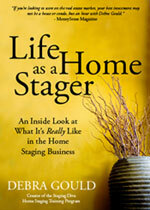 I’m always looking for new topics to address in Home Staging Business Report. Wishing you every success in your home staging business, and this bigger thing called life.